To see the best of flowers, plants and garden design all in one place was an absolute treat and well worth every penny! Like most of the crowd we were wowed by each and every garden, taking in the construction and the use of flowers and plants – in particular observing the use of ornamental grasses amongst all the lovely flowers and seeing the wind create movement along the borders as it rustles the various grasses was just beautiful! 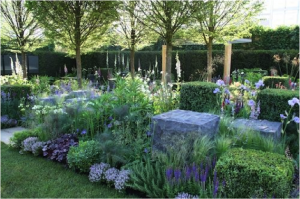 We loved the symmetrical layout and the exciting use of form with the flowers and plants and how they staged them according to height, shape and width which made each plant and flower standout. We particularly loved the feathery fronds of the grasses blowing in the wind next to the strong solid topiary box (absolutely breath-taking!) 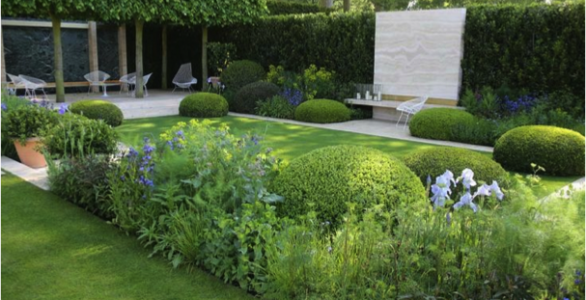 We took so many pictures of this garden in the hope we can recreate something similar in ours…. A bit of wishful thinking never hurt anyone! Having been inspired by the wonderful displays at Chelsea, we have themed our ‘summer’ look based on the English countryside and came up with ‘Meadows’ as our key look this season. 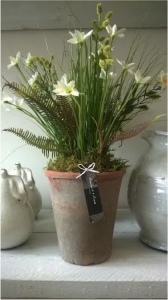 Here is one of our striking Limited Edition Silk ‘Meadow’ Pots mixing grasses and ferns with meadow flowers in a beautiful aged terracotta pot. Perfect for any home and better still, being silk you won’t have to worry about watering or any maintenance. Available to buy in-store now.